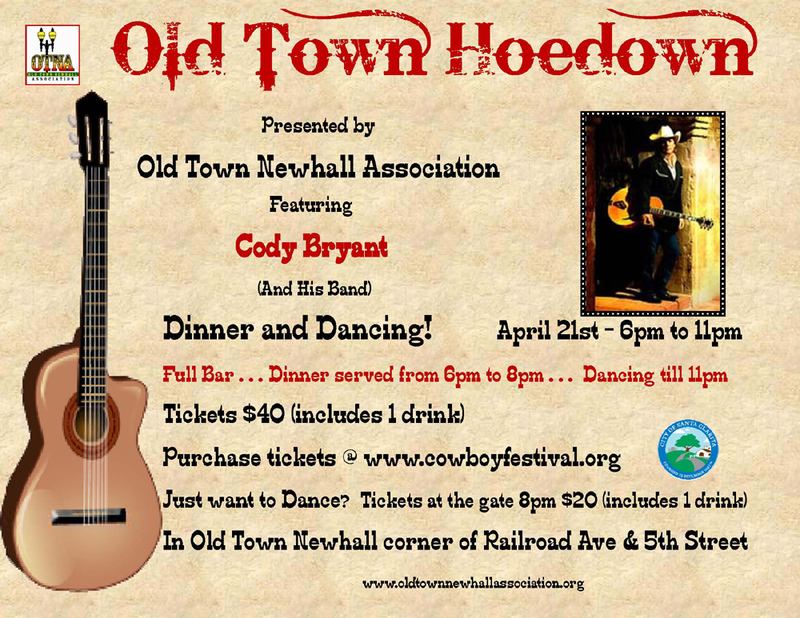 The Old Town Newhall Association is excited to bring the Cowboy Festival’s newest live entertainment event, “The Old Town Hoedown” on Saturday, April 21, from 6 p.m. to 11 p.m.
Cody Bryant and his band will perform live off of Main Street in what is sure to be the festival’s most spirited event with dancing, dinner and drinks. Tickets are available by going to the Cowboy Festival website at www.thecowboyfestival.org for Saturday Night’s live outdoor venue, with gates opening at 6 p.m. for dinner and 8 p.m. for those with other dinner plans. The event is conveniently located at the southwest corner of Railroad Avenue and 5th Street, adjacent to the city’s public parking at Main Street and 6th, in the heart of Old Town Newhall. This year’s Cowboy Festival is loaded with activities on and off Main, providing visitors the opportunity to experience the streetscape of Santa Clarita’s historical Arts and Entertainment District where the routes of Hollywood Westerns began, and where William S Hart and Tom Mix were made famous. Witness first-hand the city’s transformation and restoration of the original Main Street where the community planted its roots in the Santa Clarita Valley. Dinner tickets are available for $40 per person. Dinner features food from one of Newhall’s most popular restaurants, The Egg Plantation, serving up southwestern fajitas, with a full bar serving beer, wine, well and soft drinks. Dance, entertainment and bar tickets are $20 and will be available at the gate or in advance by contacting OTNA manager Suzie Szabo at 661-253-0730 or OTNA@sbcglobal.net. Visit OTNA’s website, www.oldtownnewhallassociation.org, for a year-round event calendar that includes Taste of Cinco De Mayo, the 3rd annual Old Town Car Show on Sunday, June 24, the city’s Weekly Farmers Market every Thursday from Spring through Fall, an Art Walk on the first Thursday and Senses on the third Thursday every month.